(Phys.org) —Scientists working at the Stanford Institute for Materials and Energy Sciences (SIMES) have improved an innovative solar-energy device to be about 100 times more efficient than its previous design in converting the sun's light and heat into electricity. so 4 times OK, 100? Single-junction silicon cells have a limit of 33.7%, but for mufti-junction cells it is 86%. Since this specific technology can use the entire spectrum, it would also have a limit around 86%. Cells for concentrators that can run at high temperatures without extensive heatsinks will be a major step up. 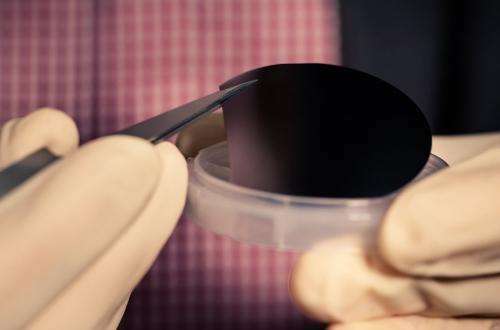 Yup, this particular type of chip/cell is significantly less efficient (article says 2%) than a conventional photovoltaic cell (what most people think of when they think about solar panels), but uses more of the spectrum than conventional cells, including portions that produce heat. 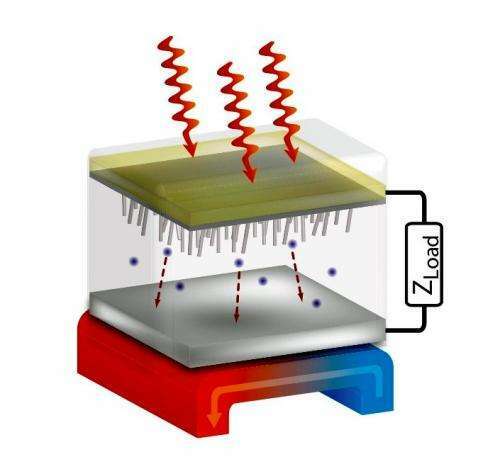 Conventional cells become less efficient the hotter they get, which is why cooling ideas like what V3 Solar (http://v3solar.com/) came up with hold interest for solar cell users. in the world of solar energy articles, I always have trouble figuring out whether this is just "we made this very specific technology a lot better but it's still average overall and problematic" or "we just advanced the field and this will be in production in a year or two." Most of course fall into the former. the biggest problems with concentrated intense radiation is that it tends to destroy whatever it touches over time. creating massive maintanance costs. Wealthy, depending how well the material holds up (referring to what Jeddy is saying) this really just moved the material from impractical' to 'supplemental', according to information in the article and a colleague that works with solar energy quite a bit. I realize that it's a new material, so they can't say for sure that 'it will last this long before it's at 80% efficiency', but it would be nice if some kind of estimate was provided. I don't get it whats the point in a 2 or 3 percent efficient solar cell....what am I missing? You're missing that very solar cell technology started out with very low efficiency. The only other type of solar cell that can harness many types of frequencies is a multijunction cell. And those are freakishly expensive to make by comparison. They are very comlicated (and expensive) to make. The performance of other solar cell designs drops quickly at high temperatures. This one seems to thrive on it. It would be nice to be able to utilize the heat to generate electricity as well as using the light absorbed by a solar cell. Jeddy Mctedder I agree with you "radiation tend to destroy whatever it touch" and on top of that solar panels are already too expensive!